Umpire Angel Hernandez has filed an amended complaint in his discrimination lawsuit against MLB, requesting information about Replay Review. Our UEFL replay stats database goes back to 2014, so we present these historical statistics, relative to the suit's relevant period, which ends in 2017. Hernandez v MLB progresses this offseason. Suit History - Since We Last Spoke. Since we last discussed the Hernandez v. The Office of the Commissioner of Baseball et al lawsuit in October 2018, when Judge Barrett of Ohio Southern District Court granted MLB's motion to transfer venue to the Southern District of New York, Judge J. Paul Oetken took over the case, the two sides filed a slew of letters and motions, added and removed attorneys, and Hernandez filed an amended complaint just after Thanksgiving, reiterating his demand for a jury trial and seeking further information from MLB in regard to performance metrics, evaluations, and Replay Review protocols to address charges of unlawful discrimination relative to 1) Crew Chief promotions and 2) World Series assignments. As we previously wrote, Hernandez's ejection statistics are rather middle-road, if not fewer-than-average, and the entire situation presents a red herring of a perceived attitude issue from decades ago (e.g., Hernandez's allegation against Torre refers to a hold-over animus from 2001) that has embedded itself so deeply into Hernandez's reputation that many observers are having an incredibly difficult time divorcing the past from present-day fact. 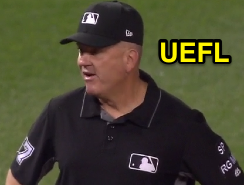 Related Post: Ballad of Angel Hernandez - An Umpire's Controversy (10/9/18). It's even schadenfreude-like in that Hernandez's three-overturn ALDS Game 3 produced a Google rating of "100" interest on October 9, 2018, versus Larry Vanover's Google interest rating of 2 on August 10, 2017, when Vanover was similarly overturned three times in one game. By the way, Hernandez's interest rating on that same day (August 10, 2017) was also 2 (he had the plate in Chicago-AL and was challenged on a hit-by-pitch call, which was affirmed as a HBP). Hernandez's 98% plate in the 2018 ALDS. For instance, Yankees losing pitcher CC Sabathia's recent call to bar Hernandez from the postseason (and, implicitly, from baseball altogether) after Boston clinched Game 4 of the 2018 American League Division Series included opinions masquerading as facts that were not supported by evidence. For instance, Sabathia said, "He's absolutely terrible. He was terrible behind the plate today," all while the actual plate performance score Hernandez put up in Game 4 was the highest of the entire series, even benefitting Sabathia specifically to the tune of calling one additional strike on a Sabathia-thrown pitch outside of the zone, and getting 100% of his ball calls correct. Though Hernandez's replay performance during the ALDS was historically poor, his plate was significantly strong. 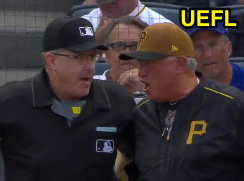 Related Post: CC Meta Game - Is Open Season on Umpires MLB Ploy? (10/10/18). SIDEBAR: Sabathia's statement ("he was terrible behind the plate today") is an example of the immature Freudian defense mechanism known as projection. Sabathia is the one who lost the game, and Hernandez's plate performance was statistically stellar. I'll reiterate that the Commissioner's Office's continued failure in recent years (since, approximately, 2016) to adequately address the Kinsler- and Sabathia-esque personal attacks (in additions to the Gomez, etc. episodes targeting umpires other than Hernandez) increases the likelihood of a potential hostile work environment claim with EEOC down the road, but that's another issue for another day. Profits above people. Umpires are the "people." Pedro Martinez too has repeatedly said things like, "He's as bad as there is" in front of a national audience, all without supporting evidence. After all, baseless claims are rather routine in today's society, and, as we've long known, objective evidence is the enemy of emotional argument; thus, it would be in the best interests of those like Sabathia and Martinez to quash such discovery in favor of generating prosperous storylines. MLB, of course, has an additional concern relative to the privacy rights of its umpires and Umpiring Department. Accordingly and not surprisingly, MLB bit back at Hernandez's requests for employment documents, requesting confidentiality in regard to grievance and arbitration material, as well as umpire training, evaluation, and replay-related information. MLB also accused Hernandez of weaponizing the legal process to breach the privacy rights of others. Judge Oetken agreed, in part, issuing on November 28 a protective order regarding procedures to be followed as to the handling of confidential material, though the judge didn't agree with MLB's allegation that Hernandez was "weaponizing" discovery or ostensibly acting in bad faith. Disclaimer/Lest We Forget: MLB reviewed umpires calls long before Replay Review's expansion (and still does)...we just never heard about it. Umpires were constantly observed/reviewed behind the scenes, and could watch a disc/video of games/calls. Correct/incorrect existed prior to replay's 2014 expansion, and thus, the following statistics represent a somewhat limited basis for evaluation. These are likely some of the documents Hernandez is requesting in his amended complaint. The Stats: To the extent plainly available, we present Replay Review statistics during the relevant period, namely 2014-17. Included are Angel Hernandez and the seven umpires promoted to crew chief between 2013 and 2017 (years as a full-time crew chief indicated in bold). The stats table includes Replay Affirmation Percentage (RAP), league-wide RAP ranking, and raw number of calls overturned (QOCN). Here are the leaders, amongst crew chiefs and candidates for crew chief (defined as those who promoted to crew chief between 2015 and 2018 [e.g., after Replay Review's expansion] and broken down into two groups - those already hired by the indicated year and those hired in a subsequent year), for overturned calls (QOCN). 2018 is also included for illustrative purposes (though, bear in mind, Hernandez's suit was filed in 2017...more on this in the "what this means" section). > 2014: Cederstrom (14); T Barrett (12); Welke, AH (11); Layne (10). > 2015: Hirschbeck, T Welke (12); Kellogg, Meals, Vanover, West (10); Davis, Miller (9); AH (8). > 2016: Davis (16); Meals (15); Emmel (14); Hirschbeck (13); Miller, Scott, AH (12). > 2017: Vanover (18); Holbrook (12); Emmel, Layne (11); Davis, Nelson (10); AH (9). > 2018: Holbrook (14); AH (13 incl postseason); Wegner (12); Meals (11); AH (10 reg season only). RAP vs Raw: We discussed in the past the potentially misleading nature of Replay Affirmation Percentage (RAP) because, unlike batting average or ball/strike percentage, RAP is dependent on whether the manager opts to pursue video review (via challenge or crew chief review). If the manager decides not to request a review when an incorrect call has been made or if the manager decides to request a review when an obviously correct call has been made, the RAP statistic becomes subject to team-influenced bias. Meanwhile, raw overturned values—simply put, the number of overturned calls an umpire has experienced—eliminates the possibility of superfluous reviews, though it still leaves open the door to a manager's failure to review. Paul Emmel is our QOCN statistical outlier. Raw Overturns: Regardless, take a look at the Raw Overturn list from 2014-2017. Hernandez (denoted by AH) never leads the raw overturn category; In 2014, Ted Barrett (promoted to crew chief in 2013) had one more overturned call than Hernandez. In 2015, Jerry Meals and Larry Vanover (both promoted to crew chief in 2015) had more overturned calls (10 to eight). In 2016, Meals and Paul Emmel (promoted in 2017) had more overturned calls (15 and 14, respectively, to Hernandez's 12). In 2017, Vanover, Emmel, and Sam Holbrook (promoted in 2017) all had more overturned calls (18, 12 & 11 to nine), and in 2018, Holbrook had more overturned calls (14 to 13 [or nine, if only considering the regular season]). What This Means: Statistically, Hernandez grades out better than at least one (generally a handful) recently hired crew chief every year when it comes to Replay Review. The conundrum becomes that the Crew Chiefs he bests each year in the raw overturn category are all, with the exception of Paul Emmel in 2016, already Crew Chiefs by the time they perform worse than Hernandez. This trend also exists for top replay CC Everitt. For instance, Meals and Vanover didn't make the overturn leaderboard until their inaugural season as Crew Chief in 2015; Holbrook didn't make it until his promotion year of 2017; Wegner didn't make it until his promotion year of 2018. The only outlier is Emmel in 2016, wherein he was promoted to Crew Chief in 2017. It's as if MLB wanted to hire Emmel prior to the 2016 season, but there were no available slots, so his promotion was held over until 2017. 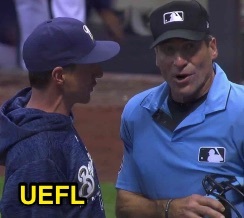 A final case study can be found with Mike Everitt, who was a top-tier Replay umpire as a number-two prior to his promotion to Crew Chief in 2017 (no more than six raw overturns from 2014-16). Upon promotion, QOCN spiked to nine. Had he not been injured in early 2018, we would have expected Everitt to return to six-to-eight raw overturns. Thus, our conclusion is simply this: Umpires generally experience a regression in Replay Review performance upon promotion to Crew Chief. Had Hernandez been promoted to Crew Chief in 2017, for instance, his 2018 performance would have been on par with what we would expect from a rookie Crew Chief—not the best and not the worst amongst crew chief candidates; better than some 2014-17 hires and worse than others. This falls in line with podcast guest Gary Darling's summation of a Crew Chief's responsibility: "It's a whole different mindset being the crew chief. It's like you're working the plate every night." Thus, we might well expect a rookie Crew Chief's individual performance to decrease due to increased attention toward supervising the game and crew. Related Post: Plate Meeting Podcast Episode 7 - Gary Darling (11/27/18). Hernandez had a tough '18 Replay postseason. Because promotion to crew chief isn't generally a rescinded transaction, it becomes rather difficult to prove any of these promotions were made at the expense of Hernandez, since statistically, Hernandez did not perform better than any of the promoted candidates prior to their promotions to crew chief, with the exception of Emmel in 2016. World Series: Replay stats for the World Series umpires from 2014-17 is a slightly easier subject. Here we simply present the raw overturns for each Series umpire and compare it to Hernandez's for that season. 2018 is again presented for illustrative purposes. Both the postseason and regular season QOCN figures are presented for Hernandez. WS Analysis: When it comes to World Series assignments, Hernandez had fewer raw overturns than at least one selected WS umpire each year from 2014-17. But so too did other eligible umpires on staff who were not selected to officiate the Fall Classic. Conclusion: All this leads to precisely what Hernandez's amended complaint states: we need more data from the league to analyze the merits of this lawsuit. Replay on its own is clearly not enough; if it were, Emmel would likely not have promoted to crew chief ahead of Hernandez (UNLESS our 2016 "no slots" hypothesis is correct), and a handful of other personnel transactions could be called into question. 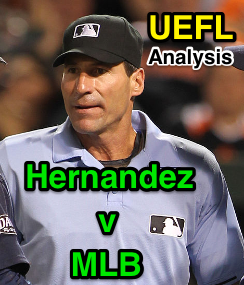 Whether it's plate performance figures, proprietary evaluation/observation information from observers throughout the league (that deviate from the favorable evaluations Hernandez presented in his original complaint), or other metrics, the League is in a situation where it must provide evidence to support its decision to deny Hernandez his requested promotion and World Series assignments during the relevant period. Now that a protective order for confidentiality is in place, hopefully, they will.